Update 1.3.6: - Port number wasn't copying to clipboard when checking the IP Address. Update 1.3.5: - New and Better IP addresses checker. My Thanks and Credits to Shawn Rice. - Now php.ini and index.php files are hidden as well. - Fixed some other bugs. I hope the initial setup works properly now. Update 1.3.4: - Uploads won't overwrite existing file with same name anymore. - Moved user defined port file to Workflow data storage. - Auto-refresh page after upload is completed! - New notification banner saying "Upload Completed". Yay. Update 1.3.2: - Upload feature revamped. Now you can Drag and Drop files and then upload [:D] You can even rename them before uploading. - It seems PHP has upload and memory limit. So uploading big files wasn't working. Hopefully everything works now. Or at least 2GB files. Update 1.3.1: - HUGE mistake. Sorry. The last update wasn't copying the new files to the Server folder. 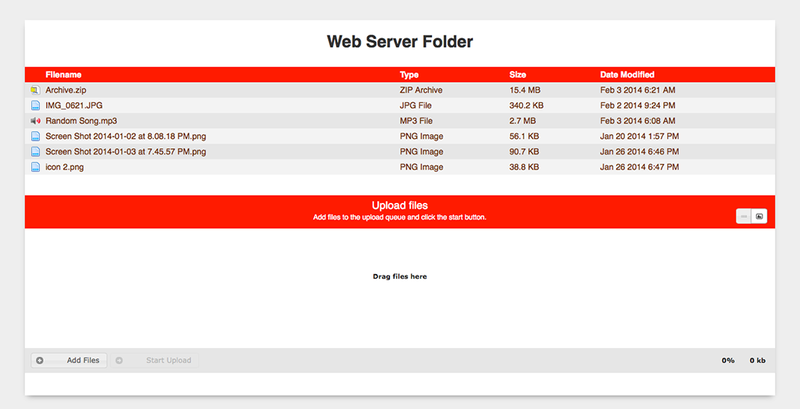 - Fixed an issue with the File Action "Add Files to Web Server". Update 1.1: - Changed Server folder location to Workflow Data storage. (Thanks, Shawn) - Added Readme content. The default server's port is set to 21025. To access the web server folder, open your browser and go to your local IP address at the mentioned port. Example: "10.0.1.5:21025"
You can access your Web Server folder from any computer in the same network. If you want people from outside your local network to be able to access your Web Server folder, you have to clear the port in your router's settings (Google "port forwarding"). After clearing the port, use your external IP address instead of your local IP address. Example: "179.233.196.211:21025"
Also, the Web Server allows you or people who are accessing it to upload files, as long as the file is an allowed extension. This limitation is for security purpose. + Keywords: - "server": Lets you start the server (if it's not running) or stop the server (if it's running). - "server open": Open the Web Server folder. This is where you put the files you want to share. - "add": Copy files selected in Finder to the Web Server folder. - "server ip": Check what's your Local and External IP address. - "set port": Set the Web Server port number to any port within the valid range of 0 and 65535, so long as it doesn't conflict with an already assigned port. + File Action: - "Add Files to Web Server": Copy selected files to the Web Server folder. Contact: @MaximiliumM Any feedback is welcome.